I've been a fan of your blog for a while now, and it's actually been a large part of the inspiration that got me to start sewing clothing. There's a particular project I'm hoping to do (even found the perfect fabric for it), but I haven't been able to find a pattern that has the bodice the way I'm looking for it (only patterns I could potentially combine - I'm still rather inexperienced though and would prefer not to have to improvise my first sleeves). I wonder whether you've maybe seen something like this with a scoop neck and sleeves (it seems fairly basic so I imagine it's floating around somewhere!). I just love the look of the brocade and found a beautiful fabric on red tag clearance at JoAnn. I'd love to make this for the holidays! What a great question, eh?? That is a super cute dress. I saw it on The Clothes Horse too and pinned it right away! 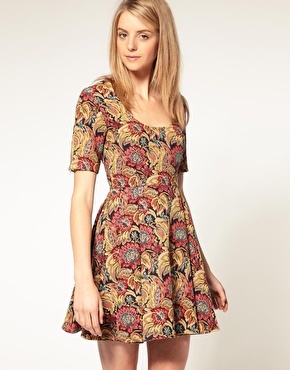 After looking at the full dress on the ASOS site, and thinking about patterns, my first thought for copying it was a discontinued pattern I used to have by McCalls, M5686—you may be able to find it online. Bodice from the green dress, style A. 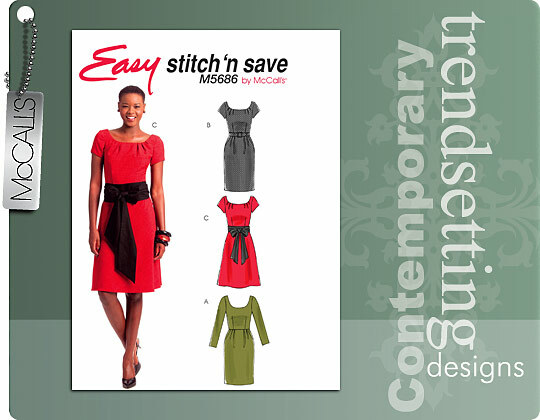 And the skirt looks like a 6-panel gored, but you could get the same look with a circle skirt like Simplicity 2233. But then, luckily, I also found what seems like pretty much the perfect pattern from Vogue! So it’ll be spendy, but sometimes they go on sale at JoAnn for $3.99 each. Seriously, this contains the right bodice (darts under the bust and under the arms), sleeves (except ASOS's are shorter, but it's easy to make sleeves shorter), and skirt lines! Vogue Easy Options V8766. One difference--the ASOS version has a lower-cut neckline than the way this looks on the model. Also, make yours fit you better than Vogue's fits her. But yeah, cut down the scoop neck an inch or so, cut the sleeves shorter, and you should have a remarkable similar-looking dress! It’s a super cute look, great for the holidays--I may have to make something like it for myself this winter! Readers, please chip in your ideas, too, if you've seen a more perfect pattern! It seems every other week that Vogue puts their patterns on sale for $3.99. Just sign up and they send you emails when they go on sale. The Vogue patern looks like a good place to start. Any advice for inserting the zippers on the sleeve? And the back zipper goes the full length of the dress...how would you handle that at the hemline? I came back to say that Vogue patterns are all on sale for $3.99 TODAY! I agree that Vogue 8766 looks like a good place to start. Just shorten the skirt and the sleeves and drop the neckline a little. Oh I like these pattern options, They're quite similar to a dress I bought quite some time ago but keep meaning to duplicate because I love the style so much! I just purchased the Vogue pattern last week - it was the pattern of the week. It's adorable. Wow, @Laura! Way to be detail-oriented. I hadn't even noticed the zippers on the sleeves or the back. You can buy looooooong zippers, sometimes even by the yard, and the back one would be easier to install than a regular one because you don't have to align the fabric at the end! As for the sleeves, it looks like a simple centered zipper--you'd cut a slit up the sleeve before you hem it, then snip in to create corners at the top of the slit and fold under the raw edge. Press. Then center the zipper and sew both sides in! Of course, the dress would still be super cute without those details!! 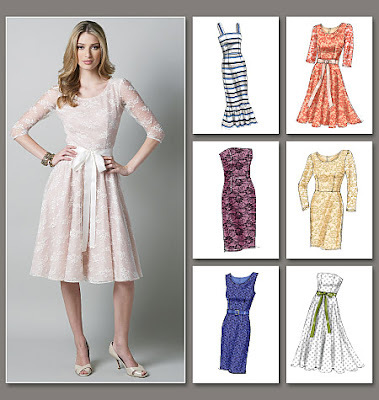 Simplicity 2247 is very nearly perfect, except the neckline is V-shaped instead of scooped. Should be super easy to modify. This is a great pattern! I bought this for my holiday dress because I wanted to make the Erdem dress Michelle Williams wore. I did a practice round without the lace for Thanksgiving and got a lot of great compliments.